Here and here did England help me! He was killed in action on 3 May 1917 during the third Battle of the Scarpe. He was 27. He was the son of John and Mary Barnard, Middle Street, Elton, Peterborough. He died from his wounds on 26 July 1916. He was probably wounded in the fighting at Bazentin Ridge on the Somme. He was 21. He was killed in action on 31 March 1916. He was 18. He was the son of William and Catherine Finney of Knossington. He was killed in action on 3 April 1918. He was 22. 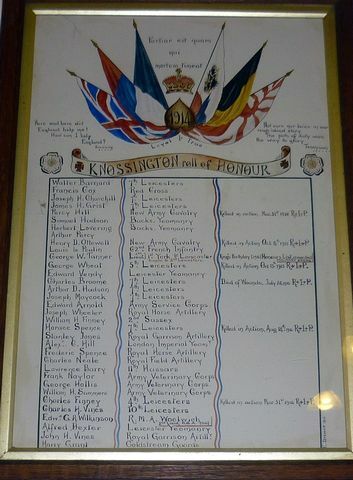 He was killed in action on 31 March 1916 during the capture of the St Eloi Craters. He was 21. He was the son of John Henry and Elizabeth Ann Hill, 78 Parkstone Avenue, Parkstone, Dorset. of Loos. He was 19. He was the son of Henry and Bertha Lois Ottewell. He was killed in action on 14 August 1916. He was 22. Ordinary Seaman, HMS Victory, Royal Naval. RNVR no. 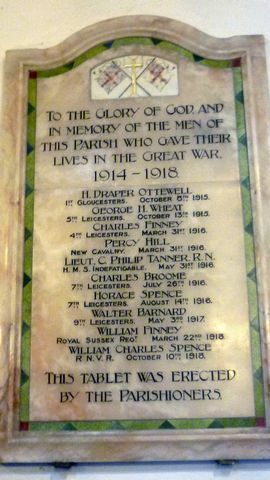 He died on 10 October 1918. He was 19. He was the son of Fred and Annie Spence of Knossington. He died in action on 31 May 1916 during the battle of Jutland. He was 22. He was the son of the late Rev. George Alfred Tanner and Josephine E Tanner, Ebor House, Godwin Road, Hastings. He was born at Cold Overton Rectory. He was killed in action on 13 October 1915 during the Battle of Loos. He was 23. He was the son of Alfred Ernest and Mary Jane Wheat of Knossington. 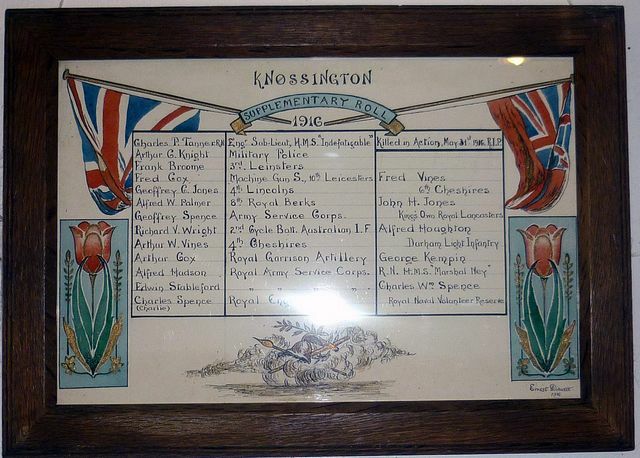 Staffordshire Regiment), 176 Brigade, 59th Division. Army no. 235067. He was formerly with the Leicestershire Regiment. Army no 4297. He was killed in action on 21 March 1918 during the Battle of St Quentin. He was 30. He is buried in grave I F 17 HAC Cemetery, Ecoust-St. He died from his wounds on 10 May 1917. He was 19. Captain, 1st Battalion, The Parachute Regiment, attached to HQ, 4th Parachute Brigade, Army Air Corps. Army no. He died on active service during the Battle of Arnhem on 20 September 1944. He was 27. He was the son of George Walmsley Blundell and Ethel M Blundell of Aughton, Ormskirk, Lancashire. Major, Royal Berkshire Regiment, attached to HQ, 4th Parachute Brigade, Army Air Corps. Army no. 69165. Simpson Dawson and the husband of Sheila Mosley Dawson of Guildford. He died on active service during the Battle of Arnhem on 20 September 1944. He was 21. He was the son of James and Maria Dolaghan of Belfast. He died on active service during the Battle of Arnhem on 20 September 1944. He was 28. He was the husband of May Donnelly of Stalybridge, Cheshire. 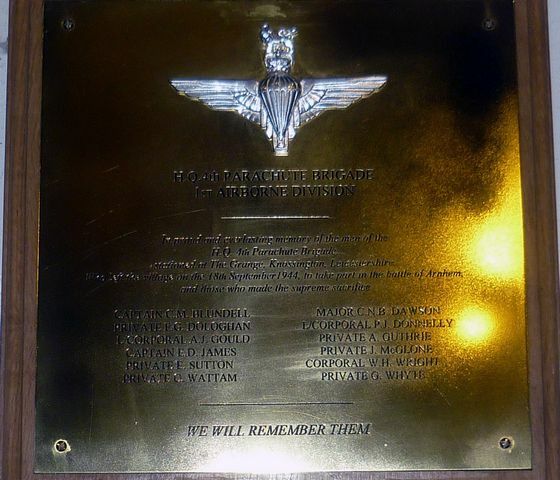 Parachute Regiment, Army Air Corps. Army no. 4690563. He died on active service during the Battle of Arnhem on 20 September 1944. He was 23. He was the son of Arthur John and Matilda Caroline Gould and the husband of Ellen Riga Arnell Gould of Whitby. He was the son of John Lyons Guthrie and Ada Rome Guthrie of Newcastle-on-Tyne and the husband of Sarah Greenwell Guthrie of St. Anthony's, Newcastle-on-Tyne. He was the son of Augustine Edmund Lee James and Ella Maxton James of Penally Abbey, Pembrokeshire. He died on active service during the Battle of Arnhem on 20 September 1944. He was 24. He died on active service during the Battle of Arnhem on 20 September 1944. He was 25. He was the son of William Henry and Jane Wright of Stainforth, Yorkshire. He died on active service during the Battle of Arnhem between 25 and 26 September 1944. He was 24. He died on active service during the Battle of Arnhem between 25 and 26 September 1944. He was 23. He was the son of George Rumgay and Mary Whyte and the nephew of Timothy Mellay of Muirton, Perth. He is buried in Sp Mem. C grave 6 Amerongen (Holleweg) General Cemetery.